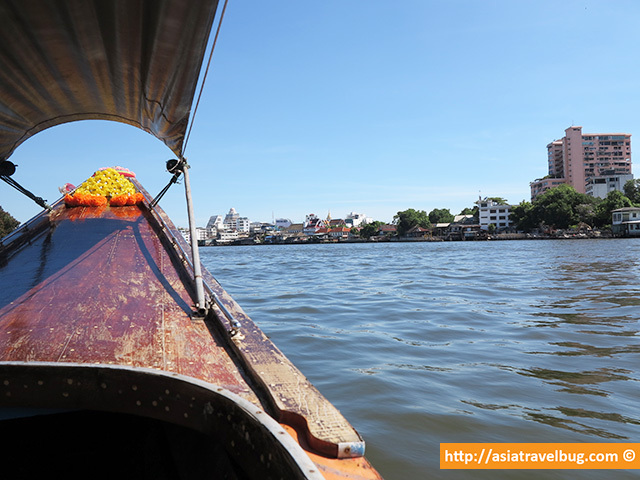 I recently returned from a 4-day Thailand trip and was very glad that I pushed through with my Bangkok travel plans. It’s good to see with my own eyes that the real situation in Bangkok appears to be not as bad as the one portrayed by the media. In fact, I did not see any army and protesters through out my stay. I felt very safe and even rode a taxi at 10 pm alone. Having been to Bangkok three times, I did not feel any difference except that Suvarnabhumi Airport was rather empty compared to my Bangkok trips years back. Had I not heard about the Thailand coup and martial law in the news, I wouldn’t think that there’s a political crisis going on – that’s how normal things are in Bangkok based on my first hand account experience as a tourist. 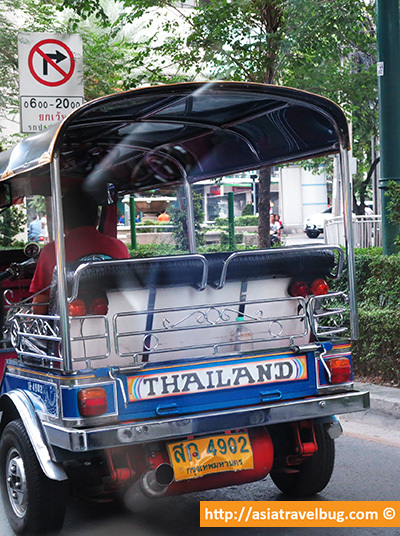 Just like any traveler with booked flights to Thailand, I had second thoughts of cancelling my Bangkok trip due to the volatile political situation in the country. I am a very paranoid about travel safety and became even more nervous when the coup was declared in Thailand one week before my scheduled flight to Bangkok. At that time, several countries issued yellow travel alerts encouraging holiday makers to avoid unnecessary travel to Thailand. So thinking that worse had come to worst, I called up my travel insurance company and had my claim papers ready for my non-refundable flight. But before I filed my insurance claim, I contacted a relative who is living in central Bangkok near MBK to check how things are going. It’s comforting to get an insider information about Bangkok from someone I know since birth. I got information that soldiers remain to be in MBK area but nothing really tense. I received this photo which my relative took in front of MBK mall. At this point, I decided to push through with my travel plans. If people who are living in Bangkok felt safe despite of the political situation, I thought that traveling there for 4 days should be quite safe. The safety was further reassured by other Thai locals whom I’ve met in Bangkok with all of them claiming that the coup did not impact their daily lives. So the day came when I was scheduled to fly to Bangkok. 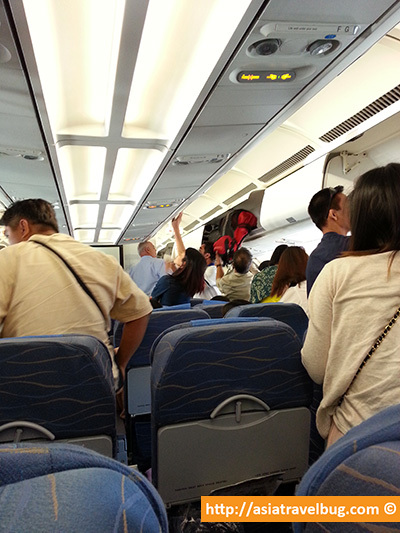 To my surprise, the A330 300-seater plane to Bangkok was jam packed and 99% full. I felt very relieved to see that there were so many brave people heading to Bangkok despite of the coup. Well, I’m pretty confident that all these travellers came back home happy! Yes, my trip to Bangkok during the first week of June felt very safe. I even felt that my recent Bangkok trip was safer than my trip to Paris 6 months ago. But I am in no position to advise that traveling to Thailand is going to be 100% safe going forward as political situation may change. The political situation is something anyone in the private sector can hardly control. However, I feel very positive about the situation especially that curfew has now been lifted from several tourist hotspots outside Bangkok including Phuket. 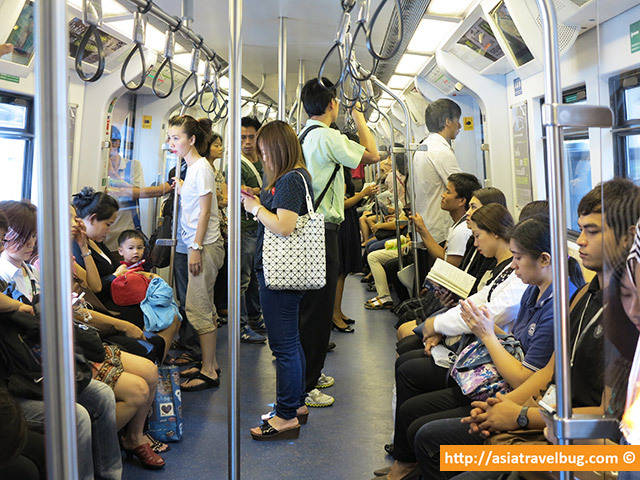 [6/18/14 Update: The martial law remains in place but curfew has now been lifted in Thailand nationwide.] 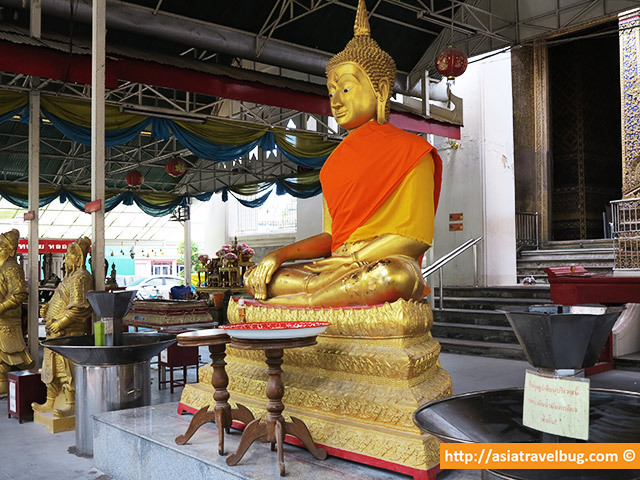 Let me share some practical travel tips to help you with your Thailand travel plans. 1. Ask friends, relatives or work colleagues based in Thailand to know the real situation. I realized while in Bangkok that things can be blown out of proportion by the media. It is highly possible that what you see on TV is not representative of the current real situation in Thailand. So better check with someone you know based in Thailand to get a more accurate travel information. 2. Follow Richard Barrow on Twitter. If you do not have any contacts in Thailand, I suggest that you follow updates from Richard Barrow. His tweets about the coup situation in Thailand are pretty accurate. Continue to follow his tweets once in Thailand to get information on places to avoid. 3. Have an insurance and make sure it covers civil unrest. For contingency purposes, have a travel insurance and talk with your agent to ensure that the political situation in Thailand is covered. 4. Use common sense to avoid trouble. Although taking selfies with the army look fashionable these days, there is always a safety risk involved when you approach someone with a gun. Exercise common sense and try to avoid getting to places with army and protesters. 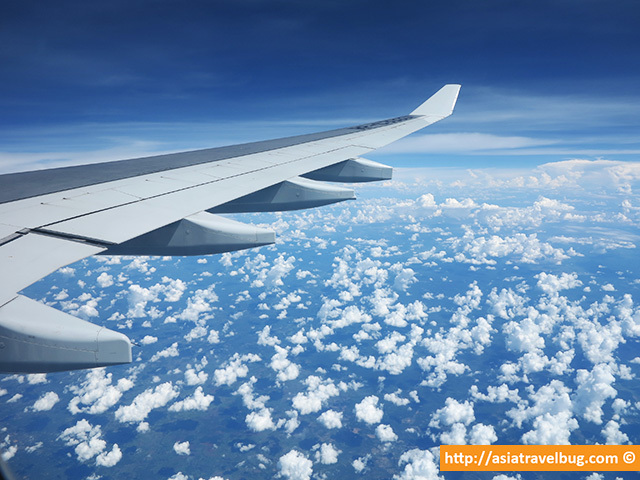 The decision whether you will continue with your travel plans to Thailand is ultimately yours. 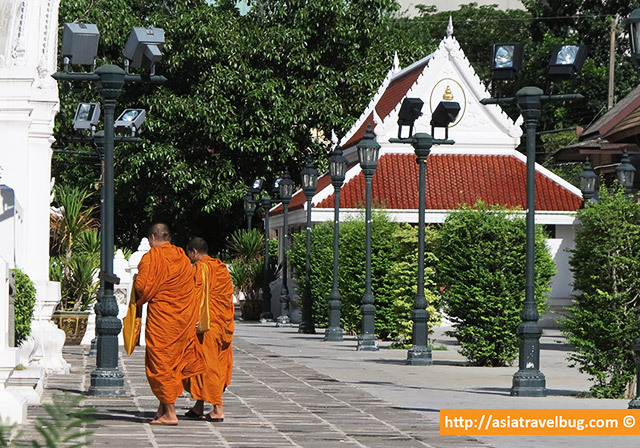 However, there are pretty good reasons why it is a good time to visit Bangkok now. 1. It remains to be business as usual in Bangkok. A lot of people have been asking me if it is safe to travel to Bangkok. Well, I say that Bangkok appears to be business as usual. I took the taxi, rode a long tail boat and got into BTS train during rush hour and I did not feel anything unusual. 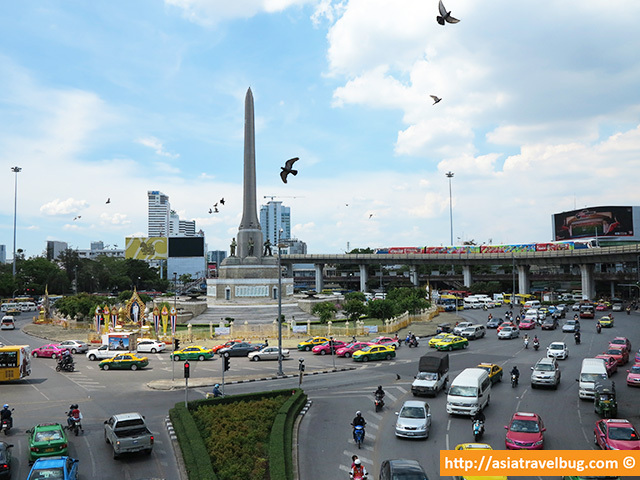 I went to a number of tourist places in Bangkok and felt very safe – Central Pier, Chao Phraya River, Thonburi, Siam-Central World shopping areas and even Victory Monument. I did not see a single army nor protester throughout my 4 day stay in Bangkok and never felt threatened. Rode the BTS Train in Bangkok. Felt Very Normal. 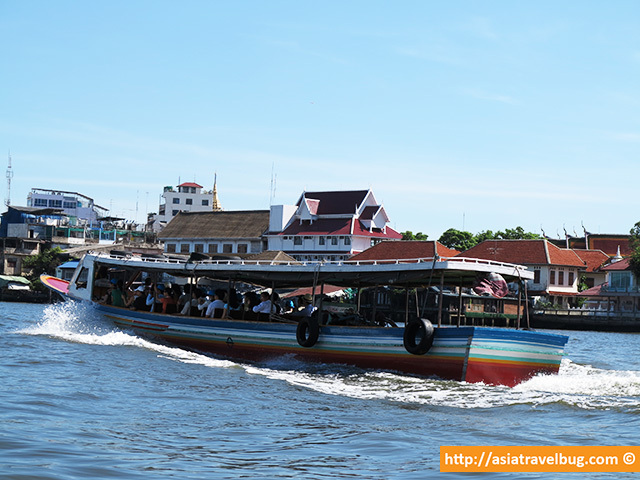 My Long Tail Boat Ride in Chao Phraya River. Felt Normal. 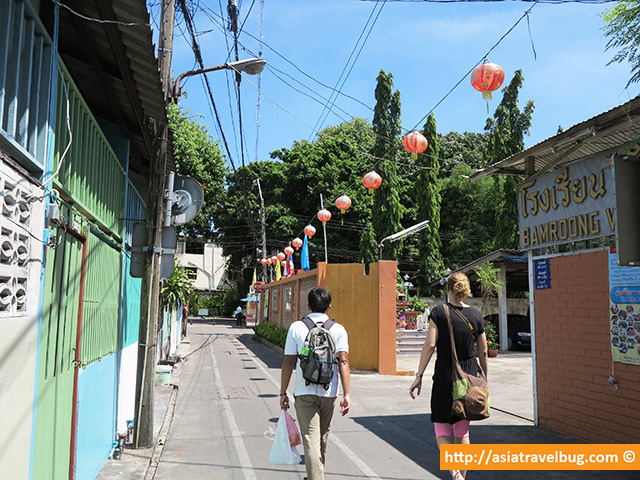 Explored the Back Streets of Thonburi on Foot Courtesy of Expique Tours. I Felt Extremely Safe. Central World-Siam Areas Appear to be Very Peaceful. Shot was Taken from my Room at Centara Grand at Central World. 2. Find 5-star Luxury Hotels at Jaw Dropping Rates. 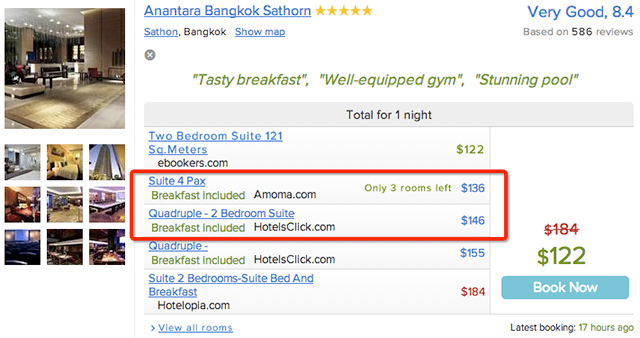 It is easy to find 5-star boutique hotels in Bangkok at USD 60 these days. You will be surprised to know that your USD 150/night mid-range hotel budget in Tokyo for 2 people can afford you a massive 2-bedroom suite in a 5-star hotel in Bangkok for 4 people, with daily buffet breakfasts thrown in for free! 3. 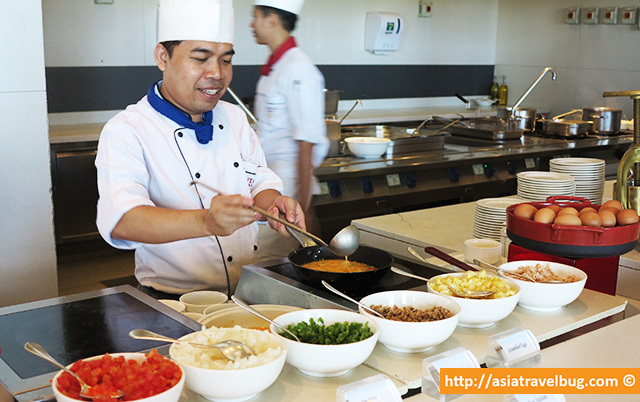 Receive exceptional Thai hospitality than usual. Since there are less tourists now, I felt I received better service this time compared to my two trips to Bangkok several years ago. Everyone who I met in the hospitality industry was just welcoming with genuine intention to please and exceed expectations. 4. No lines in restaurants. Restaurants in Siam Paragon are normally packed with people during weekends but there are less people this time. This means there are no queues in popular restaurants and you don’t waste time waiting for a seat. 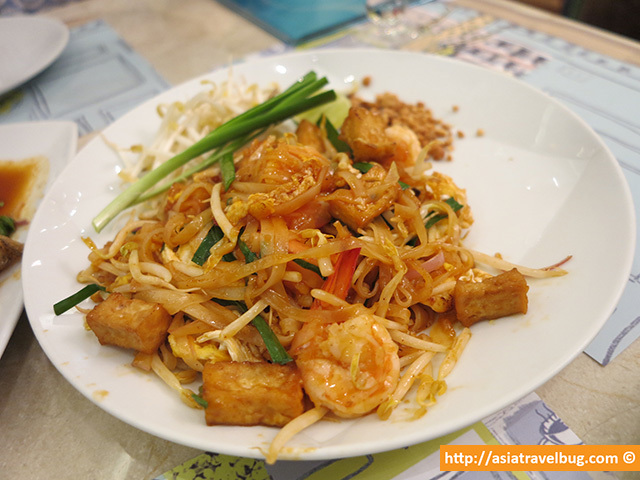 You just get to enjoy great Thai food without any hassle! 5. The fun continues in Bangkok. The curfew from 12mn to 4am remains to be in effect in Bangkok as of this writing. 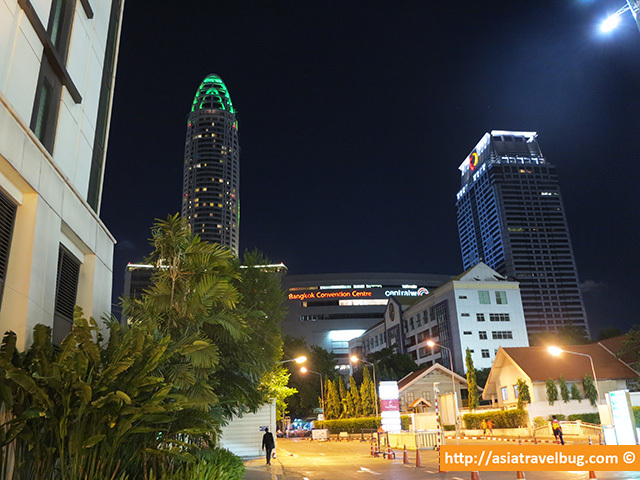 However, there are countless of ways to have fun in Bangkok without clubbing all night. 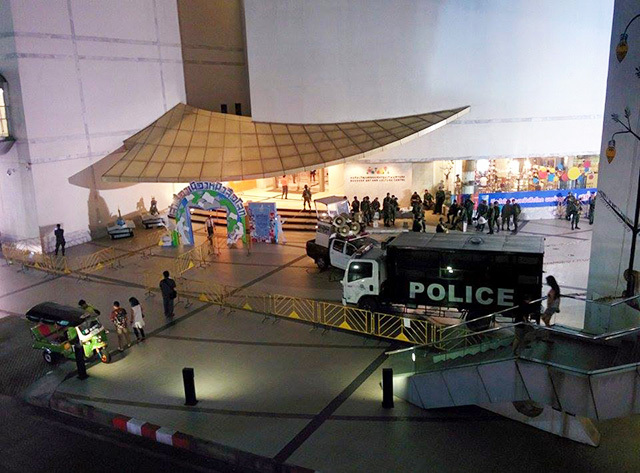 [6/18/14 Update: The martial law remains in place but curfew has now been lifted in Thailand nationwide.] 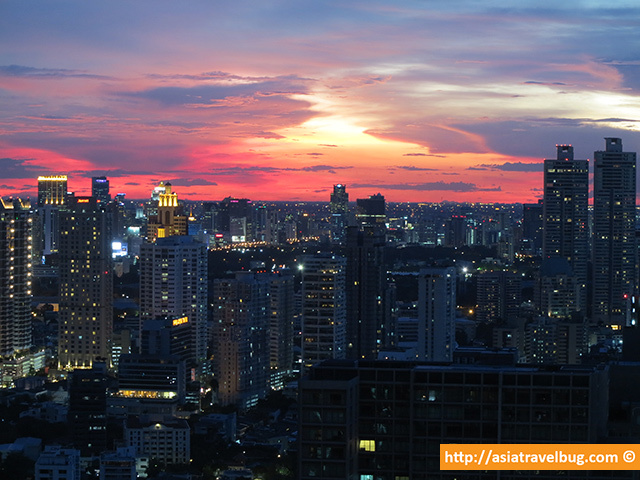 One of my favorite activity is watching the amazing Bangkok sunset from a hotel rooftop bar. 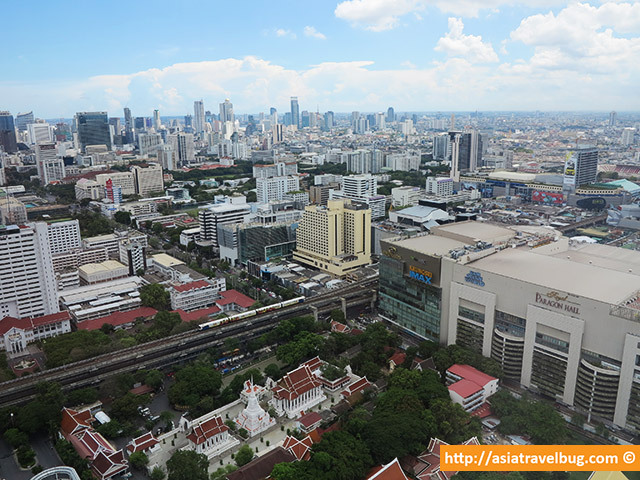 I had the opportunity to experience the roof top bars of Bangkok Marriott Sukhumvit Soi 57 (Octave Bar) and Centara Grand Hotel Central World (Red Sky Bar) and can highly recommend both. Drinks start at around 350++ Baht (USD 11++) and prices are quite reasonable for a 5-star hotel. Remember, you are paying for the “experience” and 3-star observation decks charge more. And oh, don’t forget the smart casual dress code when you plan to get to the hotel roof top bars – this means no flip flops. 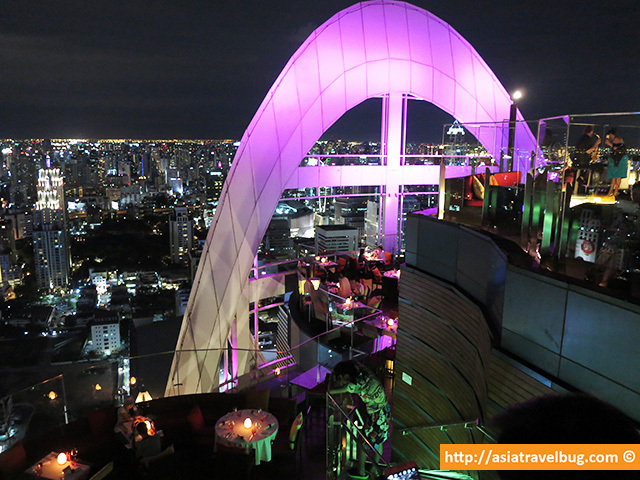 For a more convenient location right after shopping in Central World or Siam Paragon, I strongly recommend that you drop by Red Sky Bar at the 56th floor of Centara Grand Hotel. Make sure to be there early in the evening so you can occupy better seats. 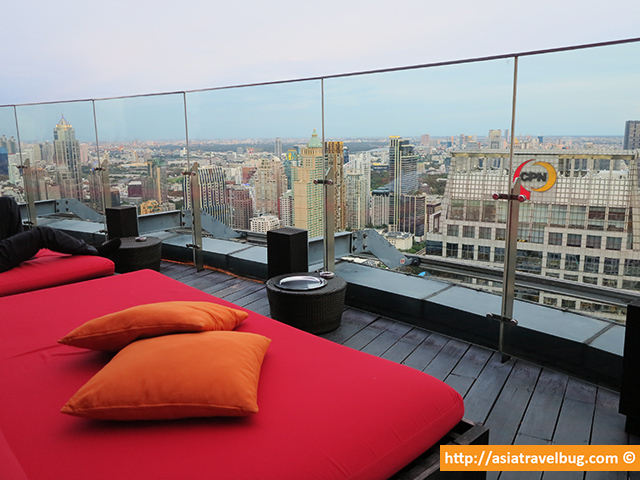 They even have beds where you can lounge as you sip your drink and watch the Bangkok city skyline come glistening at night. 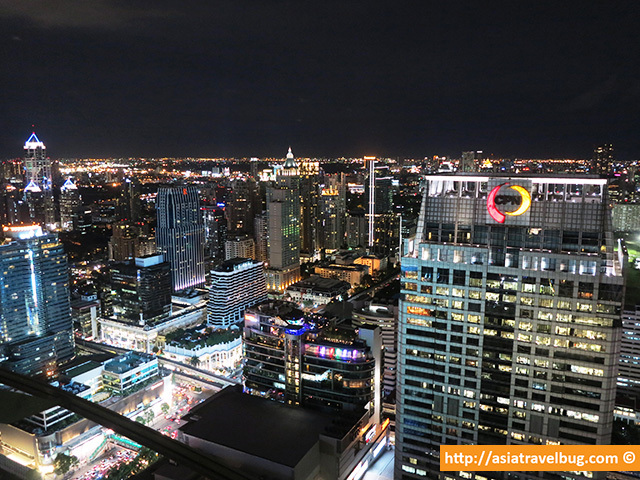 Great View from Red Sky Bar, 56th Floor of Centara Grand Hotel at Central World. Comfy Beds are Available at Red Sky Bar. Perfect to Lounge Around While Waiting for the Sunset. 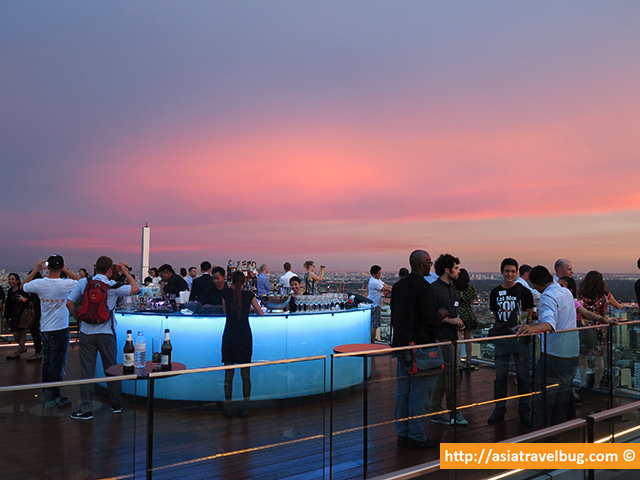 Asiatravelbug Tip: Majority of the 5-star hotel roof top bars in Bangkok offer happy hour (usually between 5pm to 7pm) when you can get a second drink for free. This is a very good deal! For a price a little over than your Starbucks latte, you get to enjoy 5-star hotel ambience, see a lovely bird’s eye view of Bangkok’s city skyline, watch an amazing sunset and get a cocktail drink! The happy hour times vary from one hotel to another, so better check with the hotel of your choice before you go. Disclosure: This Bangkok trip was partially sponsored by Digital Innovation Asia, the company which hosted the conference that I attended in Bangkok. I paid for my own flight to Bangkok and shouldered other incidental travel costs at my own expense. All opinions on this blog are my own and reflect my first hand account experience.